Each May Day, my little sister, Louise, and I would hike into our farm’s woods to search for violets, columbine, and marsh marigolds. The flowers grew near the old logging pond and under the hemlock trees. We would pick a small bouquet for our mother, Harriet, who helped us on the hike. 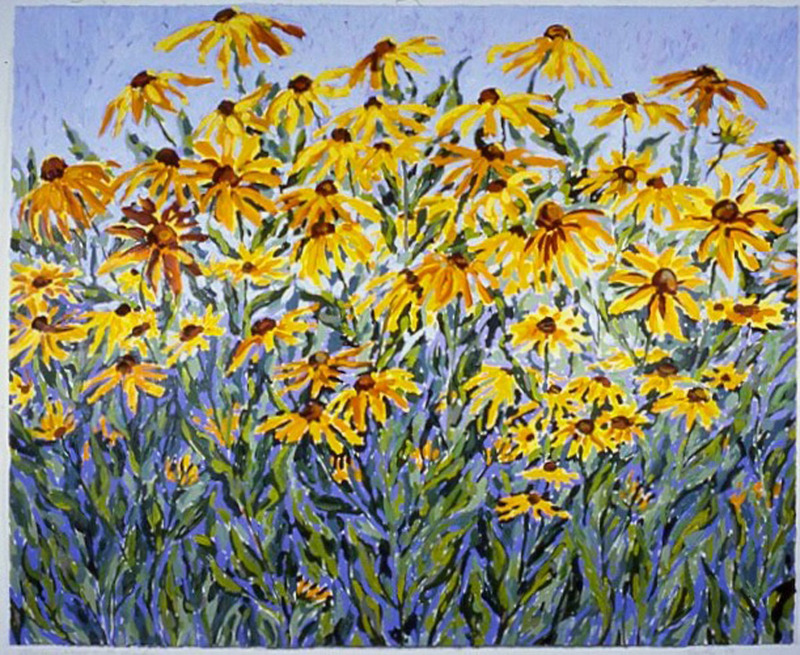 In the lanes and open meadows of the apple farm grew all kinds of summer wild flowers: asters, day lilies, Black-eyed Susans, clover, and Queen Anne’s Lace. Growing in gardens around our house were hollyhocks, lilacs, roses, forsythia, hydrangeas and Bridal Wreath. The farm’s main cash crop was apples; however, my Dad also grew plums, pears, peaches, white and red crab apples, grapes, currents, and strawberries. It was an environment that led to my life-long interest in fruit, flowers, and landscape. During my early childhood my mother would often say, “Beth, go out and pick us a flower bouquet.” I loved arranging the flowers. So it is not surprising that, as an artist, one of my favorite ways to relax is to paint flowers and fruit. The paintings are “pretty pictures,” comforting for viewers to decorate a home or office. However, sometimes the artist is the last to know what she has painted! 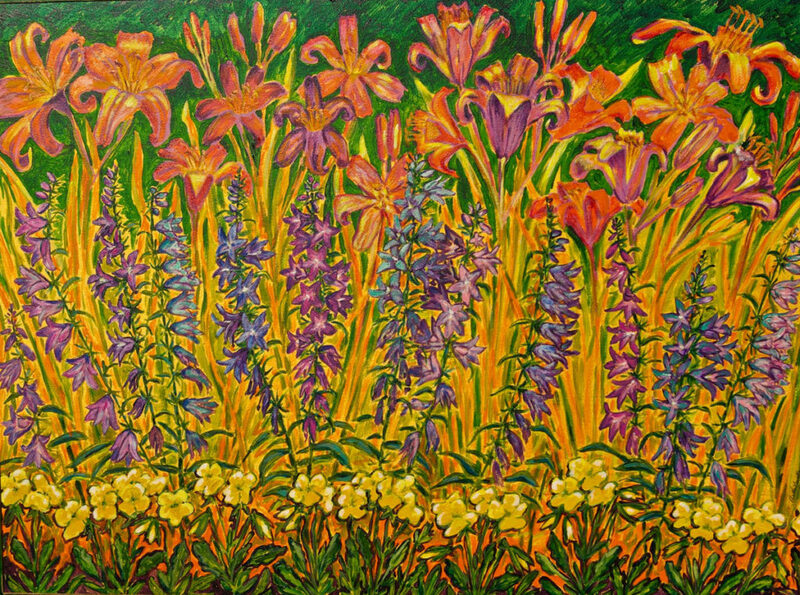 “Dogwood, Peony Tulips and Iris” acrylic, 4 feet by 6 feet, is without doubt the best floral work I have painted (#03). Its symbolism is strongly spiritual, unbeknownst to me at the time of painting! Look how carefully the dogwood branches form a Gothic Ogee arch protecting the tulips, possibly spiritual seekers, below its wings. The tulips’ outside petals are brilliant red, the color of blood, love, and lust. Inside they glow with golden, divine fire. The central Iris stand straight and tall, in a tri-partite Crucifixion configuration. 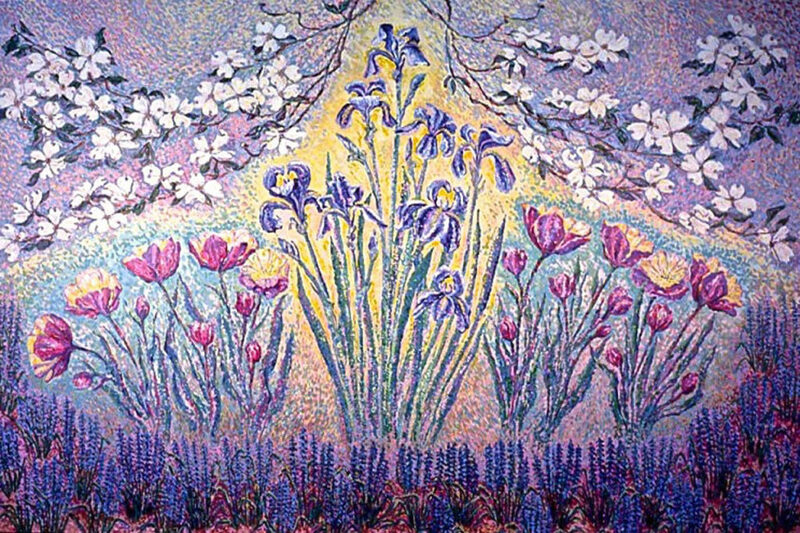 Below in the dark soil, grow purple grape hyacinths, purple the color of royalty. The flowers are painted aggressively in a Pointillist style, and the overall impression is emotional and challenging. Awake! Arise! Meet the challenges of life and the day! 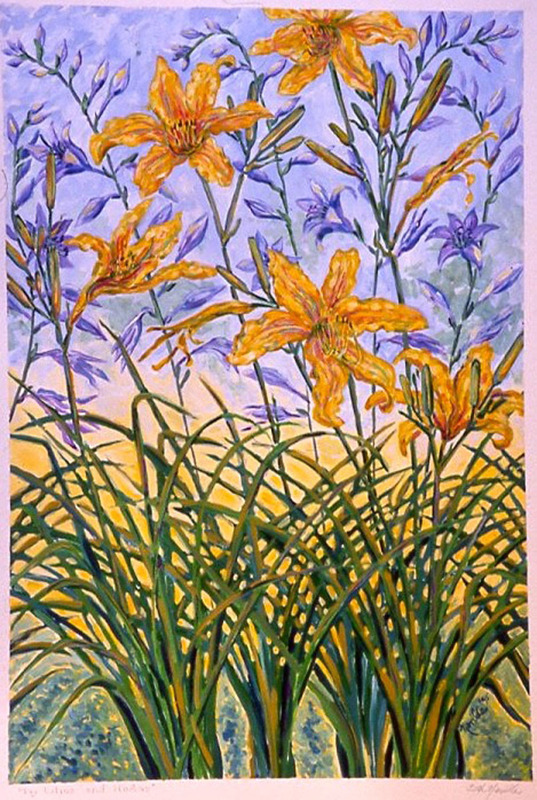 The other floral watercolors painted in 1964 (#44, 45, 46), the year I decided to “Be A Professional Artist,” are large and loosely painted with close attention to the realistic shape of the flowers. 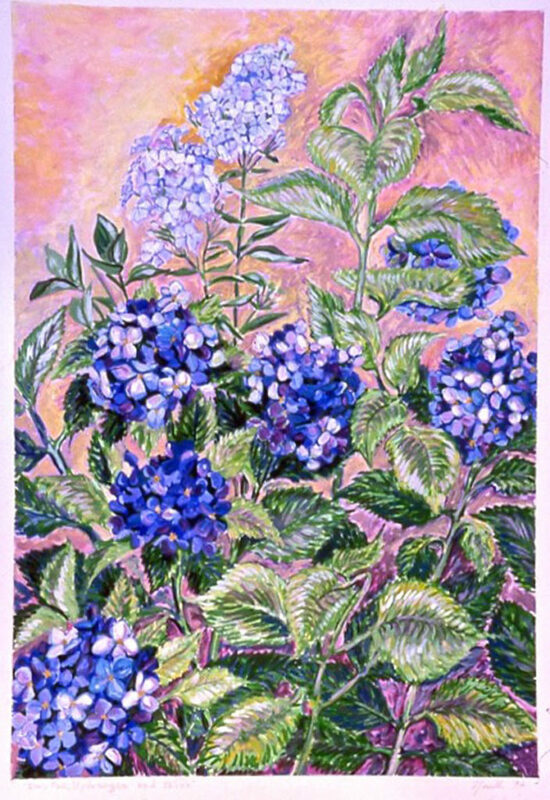 I have never stopped rendering the color and shapes of flowers and fruits in great detail. Learning drawing from the exacting Leonard Baskin at Smith College reinforced my natural inclination for botanical accuracy. But I have no interest in the clinical depiction of every thorn and leaf bracket. On the web section, Drawing in Black Mark-makers, my close observation of minute detail may be seen in drawings such as “Morning Glory” (#25), or the “Conch Shell” (#62). 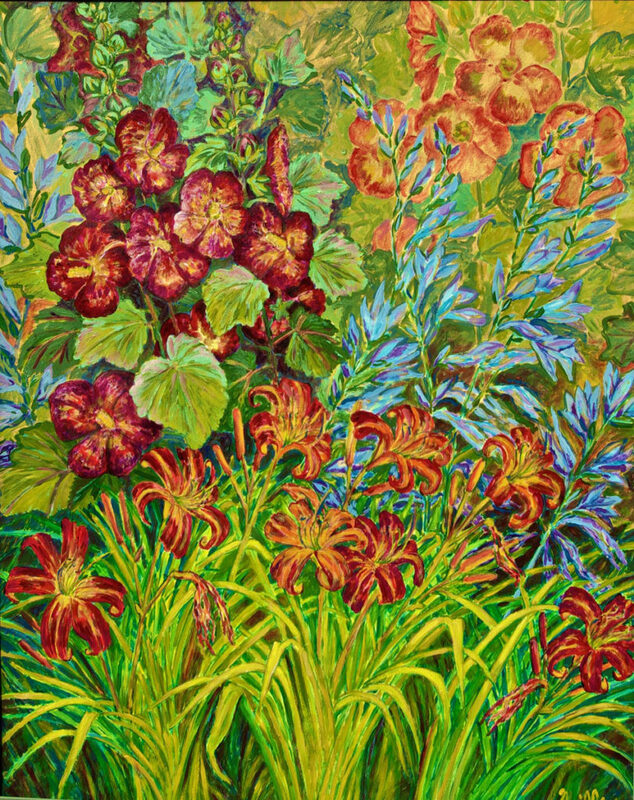 Recent floral works, “Hollyhocks” (#01), “Hostas, Day Lilies” (#02), and “Dutch Iris, Roses” (#19), are complex studies with the flowers pulsating forward in vivid, almost surreal, color combinations. There is no foreground-background and the colors are chosen for maximum contrast and impact. 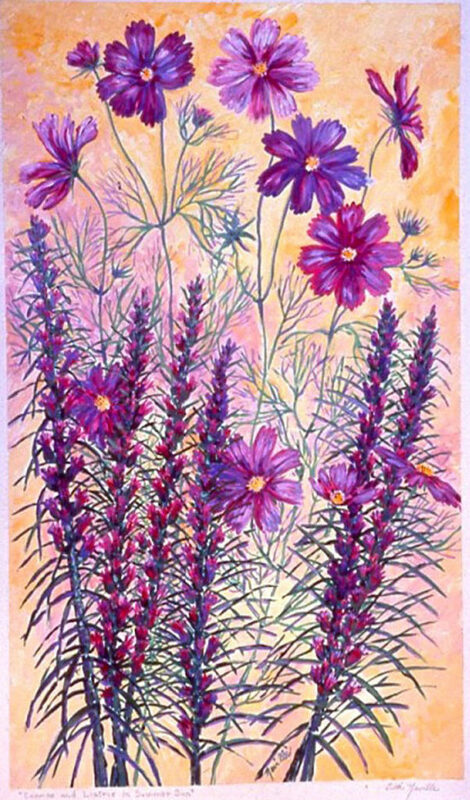 A series of acrylic paintings (#04, #05, #06, #07, #08, #09) was drawn directly from flowers in our gardens. 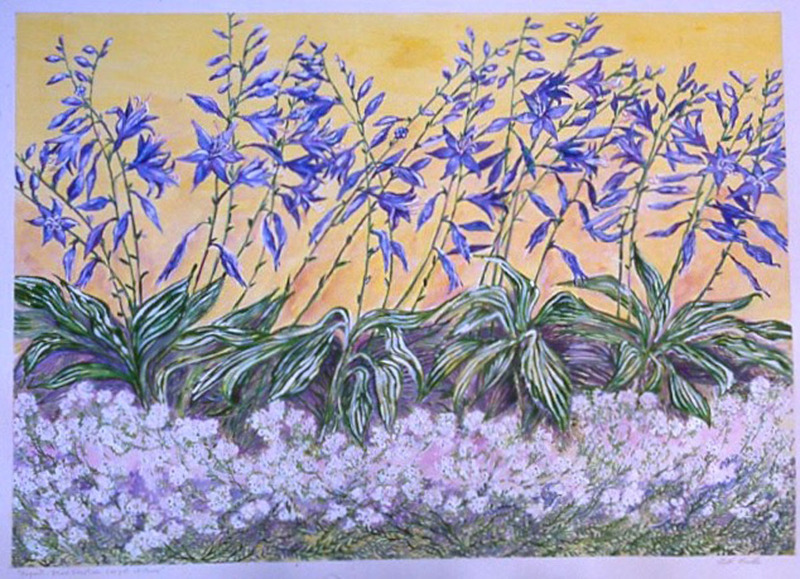 The composition stretches the flowers out across a 30-inch wide paper, creating horizontal bands of color and texture. 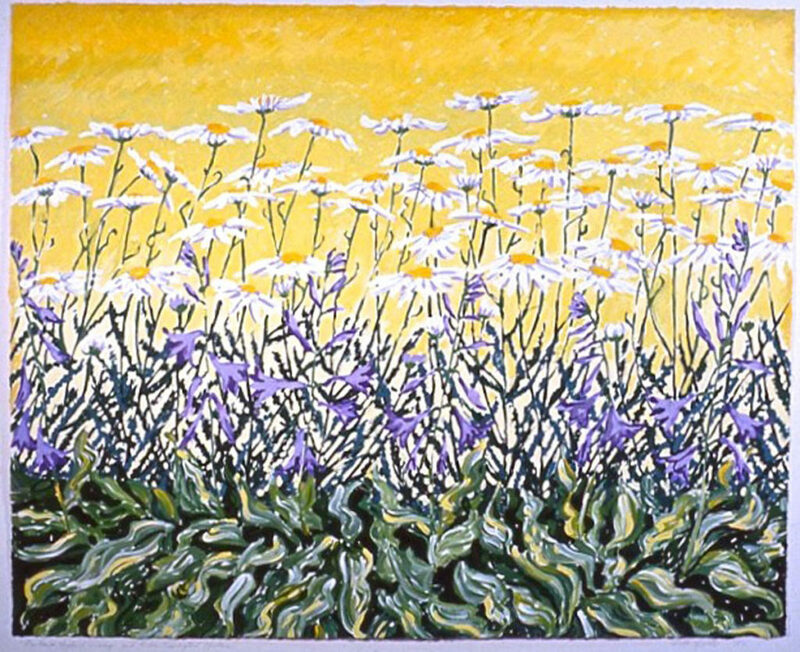 For example, in “Shasta Daisy” (#09) there are four bands, from bottom to top: green leaves, purple hostas, white daisies and yellow sky. Also drawn in our gardens were #10, #11, #12, and #13. Occasionally I revert back to teen-age years and paint in the style of my earliest art teacher, Gertrude Tipple. 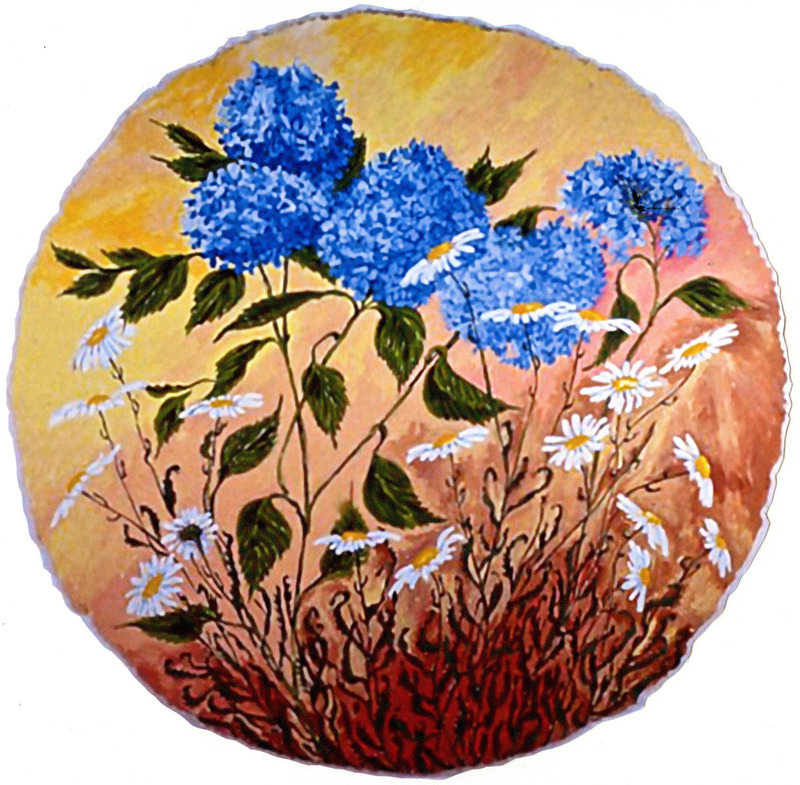 She painted “still-lifes,” a vase of flowers with a foreground object, like my “Dogwood” (#13). It is fitting that “Green Pony Vase” (#15) records the very first object I bought for myself, a green vase. 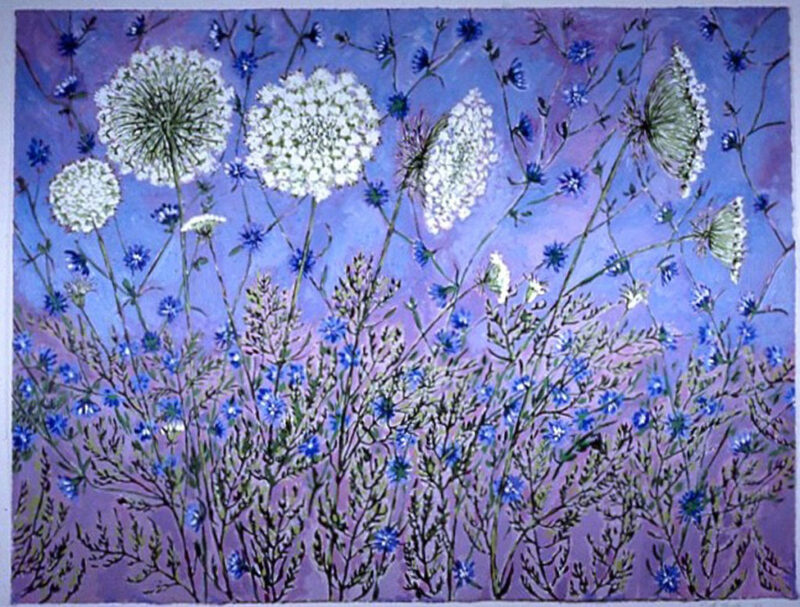 For the painting, I borrowed from Gertrude her signature object, a string of beads. Recently I learned a technique from the artist Vincent Crotty who always paints on a tinted surface. I experimented with decorative gold paint applied with a broad brush in rhythmic wave motions. Using acrylic paints and a coarse brush, I sketched a series of flowers and fruits. (See #23-#30.) They are small 8” x 8,” decorative, and bursting with vitality. The gold waves show through the painted surface. A new series of grape vine paintings (#31-#41) has enthralled me with their complex challenges. Each one is its own puzzle of 1. composition 2. texture 3. hue, and 4. value. I rework each one many times, pushing highlights forward, emphasizing lines or clusters. They occupy my late afternoons when I am tired and need a fresh creative challenge. 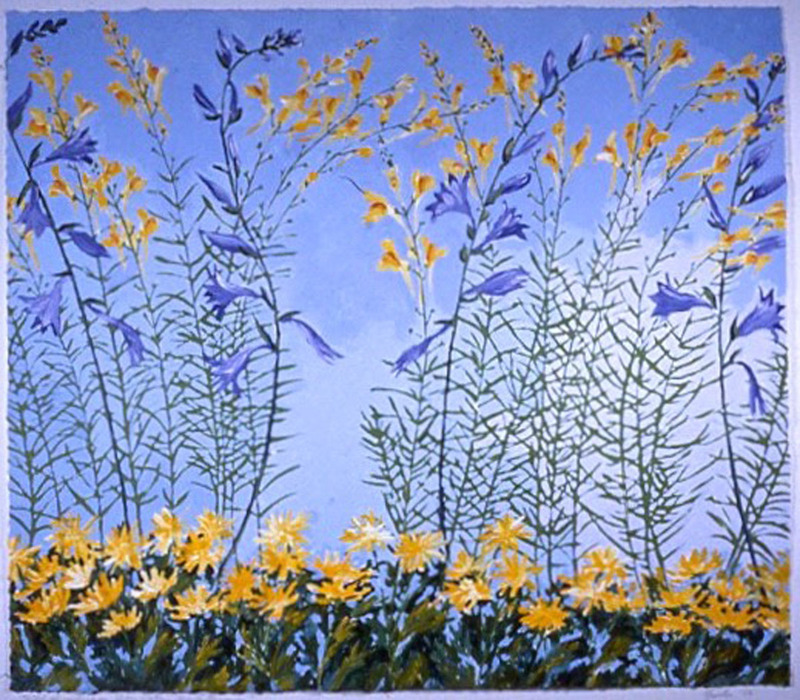 Other works deserve comment: “Morning Glories” (#16) and “White Trumpet Lilies” (#17). Both were created for antique frames that I bought from the Yale British Art Center. They are decorative with pearly gold and purple backgrounds. “Gloxinia (#18) and “Chrysanthemums” (#20 and #21) were done in the same period with gilt paint. h 34" x w 28"
h 25" x w 35"
h 24" x w 31"
h 20" x w 30"
h 18" x w 20"
h 24" x w 30"
h 28" x w 16"
h 28" x w 14"